This film received a dishonorable mention on the Worst of 2002 list. Without the big screen to enhance explosions and an audience to enhance the film's thin laughs, this flick will lose a lot of punch on video. Interview with co-star Kerry Washington for her starring role in "Our Song"
Even if it did drop the ball on tracking Sept. 11 terrorists, the real CIA still looks a whole lot smarter than their movie counterparts who recruit Chris Rock as a temporary agent in the dumb, loud and flashy action-comedy "Bad Company." A high-gloss, low-IQ product of an unholy union between producer Jerry Bruckheimer ("Pearl Harbor," "Coyote Ugly," "Armageddon") and director Joel Schumacher (who helped bury the "Batman" franchise), the film plays like somebody spliced random moments of a Chris Rock stand-up routine into what is otherwise a cliché-riddled but self-serious spy thriller -- and did a poor job of it to boot. Standing out like a circus clown at a funeral, Rock plays the long-lost twin brother of a CIA operative killed in the middle of negotiating a deal for a stolen Russian nuclear suitcase bomb. 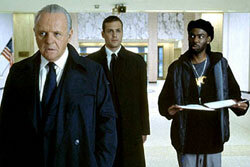 To keep the deal on track, a high-ranking spook played by the venerable Anthony Hopkins (what was he thinking?) taps Rock with the old "your dead twin brother was a spy and we want you to take his place" speech. That kind of plot device is usually reserved for B-movies starring martial artists with marginal acting ability. But Bruckheimer has never been one to over-estimate moviegoers' collective intelligence, so here comes a wise-cracking ticket scalper to save the world, and nevermind that the CIA has 15 or 20 immediately apparent and more viable alternatives. Since "Bad Company" takes itself so very seriously -- apart from Rock's showboating -- it waives its right to check-your-brain status, or such obvious alternatives might not be worth mentioning. But Schumacher is sincerely trying to make a "Ronin"-like espionage thriller underneath the incompatible odd-couple pairing of Hopkins and Rock, so as far as I'm concerned, it's open season on the nonsensical plot. Rock trains in eight days (yeah, right) to pose as a suave antiques dealer (yeah, right) who helps Hopkins (posing as a buyer who somehow doesn't arouse any suspicion) cut a deal with Eurotrash mobsters (led by a greasy Peter Stormare) for the stolen bomb. Ad libs, car chases and kidnapped girlfriends soon follow before a presently poor-taste, terrorist-themed, intelligence-insulting finale involving a countdown on the bomb's LED read-out and disarming codes memorized by Rock as seat numbers at Madison Square Garden. But "Bad Company" has gone bad long before it gets to that point. Maybe it was during the absurdly slick, CGI-animated presentation made by the CIA just to convince Rock to help them. Maybe it was when Rock and Hopkins meet the mobsters at an abandoned monastery and the agents positioned outside fail to notice some 20 bad guys bearing down on the place. Maybe it was when Rock visited his dead brother's upscale condo and was surprised by the beautiful girl in the shower. Somehow she got into the place and got naked without being seen by the CIA guys monitoring every room in the joint. Maybe it was the fact that the same CIA guys, who made Rock memorize everything down to the name of the building's doorman, somehow forgot to mention the brother's girlfriend. Maybe it was the fact that she's a CNN reporter -- as if a spy would ever date a reporter. I'm sure it was before a tracking device fell off Rock's car as it went over the most insignificant of bumps, just because the script said so. It might have been when the CIA equipped Rock with everything but a tracking device on his person, allowing them to lose him again and again throughout the movie. But certainly by the time a pathetically obvious stunt man standing in for Hopkins is fighting a bad guy in a speeding car (after which the baddies push the car over a hill and leave without killing our heroes) "Bad Company" had already become more laughable for its poppycock plot than for its Chris Rock one-liners. Hopkins is a superb actor, and although Rock is thoroughly unconvincing as the suave super-spy brother in the movie's opening scenes, he is unquestionably a talented comedian. But their talents are like fire and water here, and they're stuck in a movie as stupid as anything you could rent from the straight-to-video shelf at your local Blockbuster.